Rig Review: What worked and what didn't on the Re-Tour? Rig Review is a new type of post that I'm going to try to write up after most trips, where I'll note any things that worked really well, or could have been better. The idea has always been to optimize the Tacoma build and setup over time, so there's nothing really new from that perspective. I won't talk about everything I've got going on - just new equipment to the trip and/or any outliers that deserve a mention. At the very least, I figure that long-term, real-world reviews of the products I use are good for everyone! The Re-Tour was an amazing trip. Sure, it had a bit of deja-vu with 2017's The De-Tour weather wise right at the beginning, but by the end we had sunny skies during the day and cool nights - a great combination if you ask me. All in all, the truck worked wonderfully on this trip, with just a few things that deserved a bit of discussion. TL;DR - conceptually the fold-down-and-out table is cool but I need to rework how the far corner is supported for it to be useful. Oh, and it can't have any wooden components, since they swell up in wet weather. It was never really level - the weight of the stove caused the far (unsupported) corner to sag. 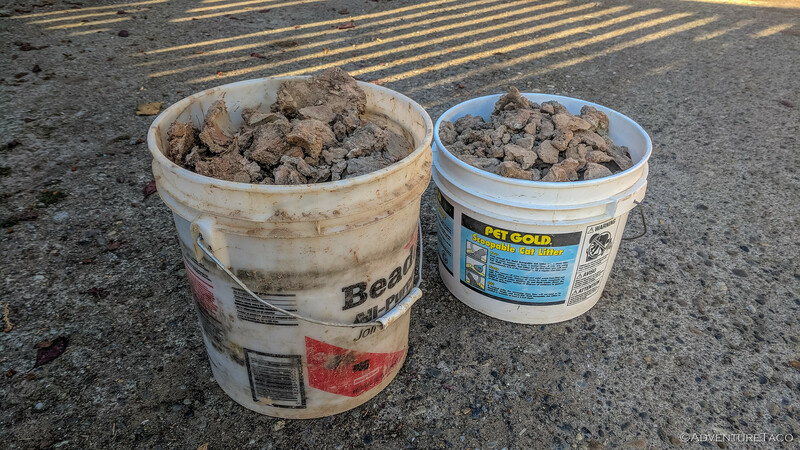 Note the rocks supporting the stove in the photo below. It never worked after it got wet (the third night) because the wood supports swelled up and were "stuck" in the closed position. I've got ideas about how to fix all of this with a second revision of the table, but for now, the initial prototype has served it's purpose and is coming off the truck. Or at least, I'm not planning to use it as-is anymore. TL;DR - There are pros and cons to this new system, but it's not quite right for me so I'm changing it all up again. 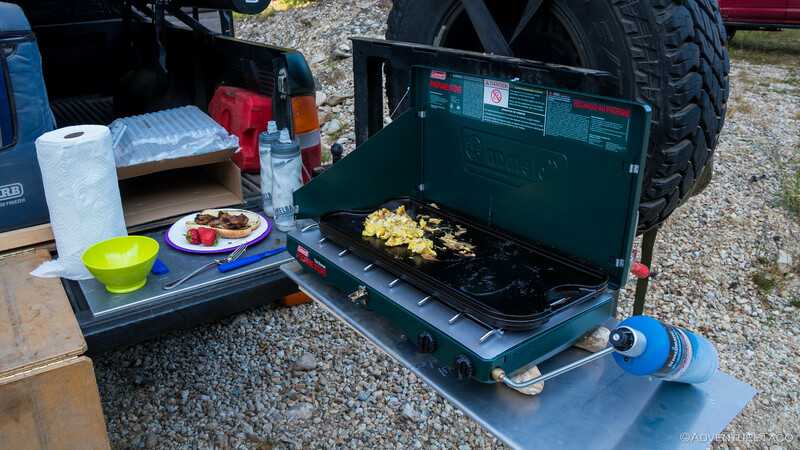 The Coleman Classic Camp Stove and Lodge Cast Iron Grill/Griddle were new to me on The Re-Tour, replacing the Weber Q100 grill that we've used for the last 5 years. My hope was that these would pack better and take up less room than the Weber, making packing of the bed easier. They did a great job at that, and I also loved how little propane the stove used, and how quickly the grill/griddle heated up. 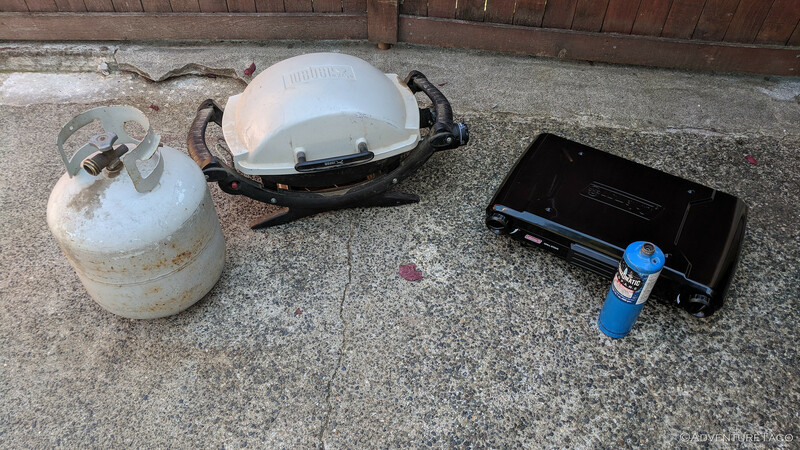 However, I grill almost every night when I'm camping, and I really missed the easy (read: none) clean-up of the Weber grill. With the cast iron griddle, there was real cleaning involved, and it was big, heavy and awkward to clean. Plus, due to the size of the grill, I couldn't use the it and a pan at the same time on the stove - something I could do on the Weber. However, I think I have a solution. I'm going to get the Coleman Camp Grill/Stove, a combo unit that has a burner for a pan and a burner for a grill. I didn't get it the first time because I thought it was a bit kitschy, and that the burner for the pan would be too small. But now, I think it might be just right. 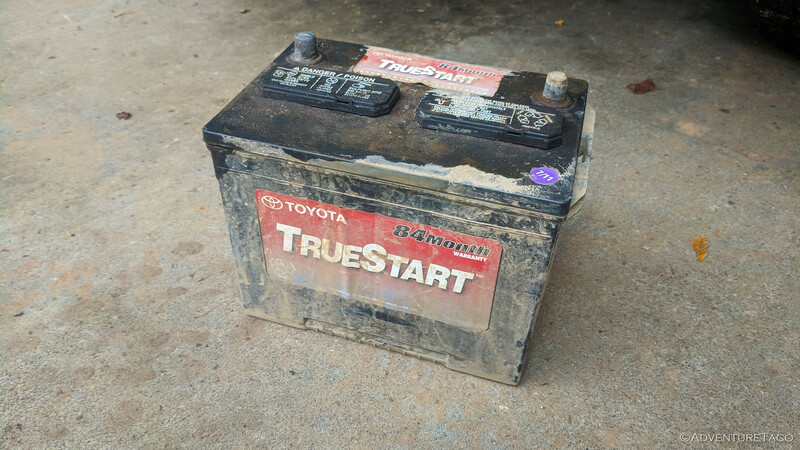 TL;DR - Though it's a great battery, my days of running a single Group 24F Toyota TrueStart battery are numbered; I'm moving to a dual battery system. And, I can no longer recommend the DBPOWER 600A 18000mAh Portable Car Jump Starter, since it failed to start my truck when I had a dead battery. To date, I've run a single battery - the main starting battery - in my rig, and it's worked great. The battery I've been running (since 2011) is a Group 24F Toyota TrueStart, and it's done everything I asked of it - started the truck, run all of the communication equipment (Kenwood D710G dual-band ham radio) (Uniden Pro 520XL CB radio), charged phones and tablets, powered the ARB on-board air compressor, kept the ARB 50qt fridge at 35ºF, and even powered the Warn M8000 winch a couple of times. On this last trip though, I had a bit of trouble on at least two separate occasions, where the fridge went into an error mode overnight due to lack of battery capacity. This issue was compounded by the realization that the DBPOWER 600A 18000mAh Portable Car Jump Starter I carry in the truck doesn't have enough power to start the truck when the battery is really dead - something I found out after I returned and tried to start the truck for the first time. I don't blame this on the battery at all - quite the contrary; I think the Toyota battery has probably performed better than it was ever expected to perform. That said, it's time to make a change - a change to a two-battery setup, so that I can run the fridge at night without worrying that I may not be able to start the truck in the morning. Likely I'll go with two Northstar Group 24F sealed lead-acid batteries, but I still need to do some research into exactly how I'll setup the whole system. Suffice it to say, this will be a winter project for me this year. TL;DR - I'd like to find a ham radio antenna that is more flexible/floppy than the one I've currently got, and that doesn't have a small section of wound metal in the middle, since that gets stuck on trees and pulls at the roof mount. I've been running a Diamond NR770HBNMO mobile antenna since I got my ham radio, and from a Tx/Rx perspective, it's awesome. However, I'm always worried that when I hit low-hanging branches, it's trying to rip itself out of my roof. Evidence of this is often clear, as it was on my last trip to the Pryor mountains. I'd like to find a whip antenna that I can replace the Diamond with so that - hopefully - when I hit a branch, it just flexes and scoots by, rather than catching itself on the foliage. TL;DR - I continue to be really happy with the main tent, for the most part. I am not however, happy with the rain fly on it due to the "stargazer" windows never ever drying off. The @Cascadia Tents Mt. Shasta Pioneer tent has been a game changer when camping. 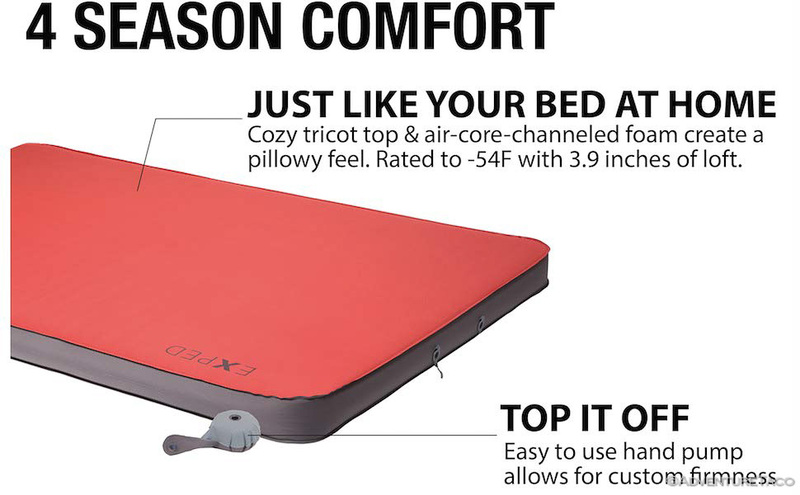 Being up off the (often wet) ground, having quick setup and tear-down, and just being all-around more comfortable are big pluses in my book. However, since the beginning there's been a problem: drying the rain fly. The plastic they are made of is not clear enough to actually see the stars. I mean, you can tell there are stars in the sky, but everything's blurry because the plastic is all "warped." So, they fail at their reason to be. The bigger problem however is that they never dry off. Unlike a normal rain fly that heats up in the morning sun to evaporate any water (rain, dew, etc. ), these plastic windows either reflect all sunlight/heat or just let it pass through, and so they never warm up. As such, any water on them (and water droplets form on both the inside and outside of them) takes forever - literally hours and hours - to dry. 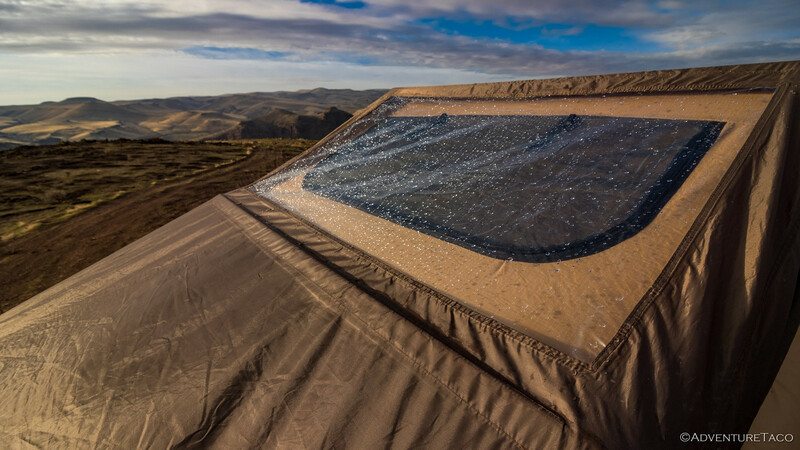 So, nearly every morning I find myself balancing on the edge of the truck rails with a beach towel in my hand, toweling off the sopping wet stargazer part of the tent - while everyone else (with normal rain flys) just let their tents dry out in the morning sun. Unfortunately, I don't have a solution to this problem. Really what I'd like is a non-stargazer rain fly. However, I don't know if CVT even makes those anymore since stargazers are now "standard" on all tents. Plus, I bet they are expensive. My recommendation to anyone else getting a tent: do everything you can to avoid the stargazer (or similar roof-window) option. Rig Review: Hiking Death Valley - What worked and what didn't? There is an easy fix for keeping tree junk out of the 'coil' in your antenna. Find a short piece of approx 1" diameter shrink-on and shrink it over your coil. Keeps branches and leaves from collecting in the coil and there is absolutely no impact on antenna performance. The best solution in the long run is to get away from the expensive high gain antennas and make your own 1/4 wavelength whip. As a ham, you know how to figure what a 1/4 wavelength of 146 mHz (center of 2m band) which will be (about 20.2 inches). Cut a wire whip to that length, add/make a cap for safety, and just replace your 'road' antenna with your 'offroad' whip when you hit dirt. HRO has a whip antenna you can modify for about $20. 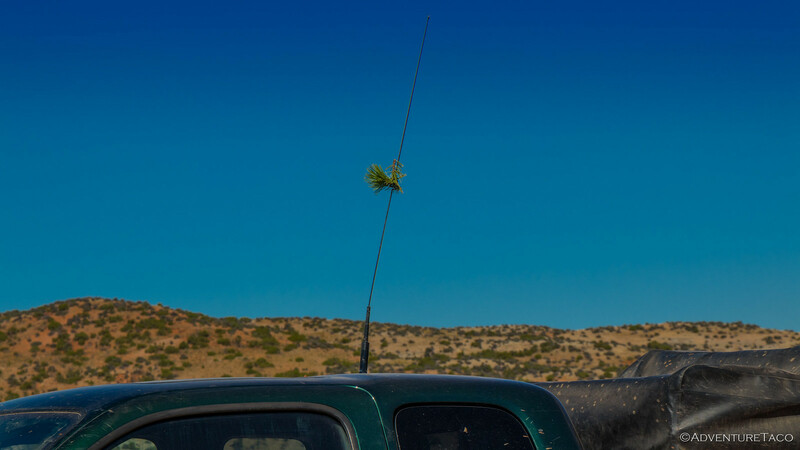 Your offroad antenna is now now pretty much indestructible and line of sight range on the whip is 10-15 miles, more than enough to keep in touch with your group or monitor for traffic. In an emergency, just remount your high gain antenna - which won't be broken or bent ;). Thanks Michael - the offroad 1/4 wavelength is a great idea, I'll probably give that a shot. I considered the heatshrink over the coil on the high gain antenna, but was worried that I'd affect the SWR (I know that the plastic cap on my firestik cb antenna dramatically alters SWR, even though I wouldn't expect it to). I use a Larsen NMO 2/70 along with the optional Larsen base spring. I trimmed the antenna length to get good SWR (compensating for the additional length of the spring). I love this combo, extremely flexible and retains the high gain. It has a smaller phase coil in the center like the Diamond but i've been thru trees regularly and it never catches thanks to the spring. Interesting. Do you have a link to the base spring you're talking about? I wonder if I could use something similar with the Diamond I'm currently running.